The Harvested tab of the Configure Auto-Complete dialog displays the words that have been harvested from the current document. 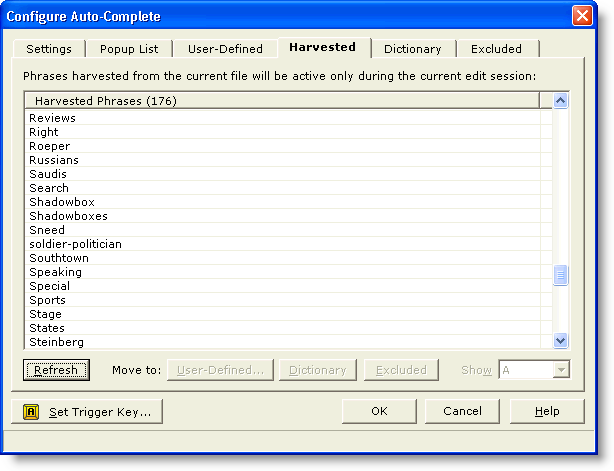 If the Harvested word list is large, the dialog will be displayed initially with an empty list. Use the Show option at the lower right to select the starting letter of the words you would like to view. The Harvested word list is a temporary and transient word list. It is built on-the-fly by analyzing the current file. When an edit session ends, the Harvested word list is deleted. If the Harvested word list contains words that you would like to make permanent, there are buttons available to move words to other lists. It is not meaningful to delete a word from the Harvested word list, because it will simply reappear in the list the next time the file is next analyzed. Use the Refresh button to request that the current file be re-analyzed to build the harvested word list. This option is useful to check the effect of changes made on the Settings dialog tab. Use the User-Defined button to move the selected word to the User-Defined word list. The New User-Defined Word dialog will appear so that additional information can be provided. Use the Dictionary button to move the selected word to the master Dictionary. This ensures that the word will subsequently appear in the popup list of matching words, even if it does not already exist in the current file. Use the Excluded button to move the selected word to the Excluded word list. Words in the Excluded word list will never appear in the popup list of matching words. Use the Set Trigger Key button to change the key that is used to complete a partially typed word, or expand a User-Defined phrase with trigger style activation.